FINALLY; A REAL PRO-LIFE VOICE IN CONGRESS!!!!! Everyone please check go this site and watch this video. It is awesome finally to hear a voice that speaks truth in the hallowed halls of Congress. Also, check out the blog while you are there as well. There is a lot of good information and the author of the blog is a pro-life warrior. The reported miraculous lung cancer cure of Filipino Archbishop Leonardo Z. Legaspi that is attributed to ‘INA’ (translation: mother) or Our Lady of Penafrancia, in my opinion, would have to stand the test of time. 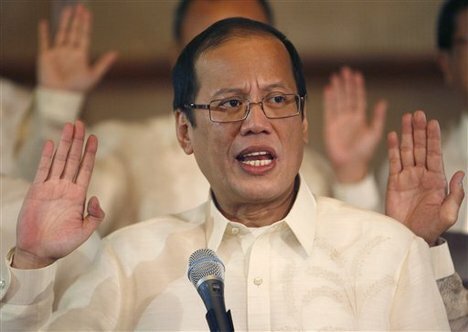 Will his Excellency still be deemed cured from lung cancer –or- free from cancer metastasis in 6, 12, 18 months? A good prognosis for such a terrible illness such as cancer, can sometimes be achieved from scientific treatments depending on the type and stage of lung cancer. General health, lung function, and other medical conditions are also crucial factors in determining the effectiveness of treatment. In His Excellency’s case these conditions are “2 sessions of chemo” and some “liquid chemo”. — not to mention his faith in God and the “collective prayers of the people”. An alleged miraculous healing must overcome two hurdles. First, medical experts must declare it dramatic and unexplainable. Next, a Catholic tribunal and/or theologians must determine that it was caused through the intercession of Mother Mary, the saint, or the candidate for sainthood. The Bicol Region (one of 17 in the Philippines) located at the Southeastern stretch of Luzon is celebrating the 300th year of the Our Lady of Penafrancia as its patron. Over the years there have been movements to strengthen: (a) the faith of young adults; (b) the belief in miraculous healings in answer to prayers of the faithful Bicolanos; (c) young adults’ devotion to Ina; and (d) increased awareness among young students of Ina (Lady of Penafrancia) as the Mother of God. The Archbishop’s reported healing certainly lends substance to centuries of Marian devotions. What I find interesting is that it was “confirmed that the Archbishop did not ask to be healed” and that “he almost lost all hope of getting well again.” These reports give me pause as to the role of faith and prayer in miracles. Other considerations regarding the reported cure is the level of journalism and accuracy of medical tests. Will rigorous reporting by the press still reveal the facts as described by the internet article? Will rigorous diagnostic tests still reveal a cure? In my heart, I believe in miracles. In my life, I’ve had experiences– I call miracles/ God’s providence– that I had NOT prayed for. Like the early Church fathers, Catholics continue to give credit to countless miracles especially those of healing. In my life, I’ve also had my prayers answered —NOT with the miracle I prayed for —but with God’s divine response for me…… In God’s love. As you probably know, a strong earthquake hit us at around at 3:40 p.m. on Easter Sunday, April 4. The news is settling on 7.2 as its force and on six miles as its relatively shallow depth, but is still wavering on the epicenter as 15 to 30 miles south of Mexicali. We immediately lost power, but I forgot to turn off my light and so was awakened when the power came on at round 4:40 a.m., April 5. After the earthquake, I spent two hours putting books back into bookcases, mopping up water from filled plastic glass, and sweeping up the debris of broken statuary and decorative objects. Then I drove around the visiting parishioners. I noticed no downed houses. Many did not want to reenter their homes and so were outside in their front yards and in the streets. They were visiting and so it looked festive. But when I would stop, they were all worried and many said they had turned to God during the quake, whose strong shaking lasted a whole minute at least. They also were expressing a conviction that God was reacting to our sins and warning us to turn back to him. One non-church going family phoned me to come over and pray over them, and the 14 y/o boy said he would be going to Mass faithfully from now on. I pray he does! Here in our rectory, Fr. Joseph Barranger, who is an excellent cook, had prepared a delicious Easter Sunday meal for us. Shortly after the dinner, the quake hit. Fr. Joseph, who is from the East Coast and not an experienced seismic rider, got outside without delay. The rest of us, used to the earth shaking, shrugged it off, but after 30 seconds of violent shaking and loud noise coming from the building, we also took off for the outdoors. We stood swaying in our front yard looking at our house and at ourselves, wondering if the roof would collapse and if we were being shaken by the ground our just dizzy. Yes, we were being bounced around both by the quake and then by strong, immediately following aftershocks, but the house stood firm. 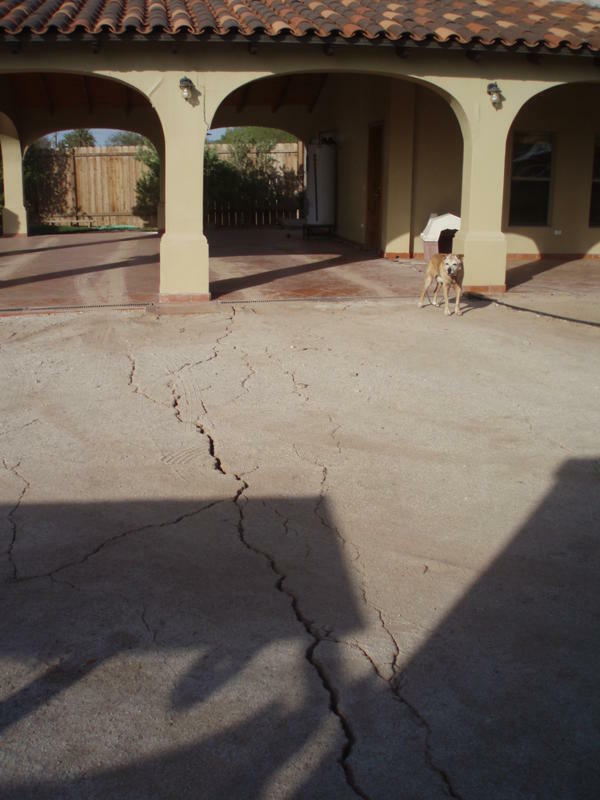 The earth cracked open along various long lines in our yard in front of our car port and through its tiled floor. The car port itself, which was attached to the house, separated from it slightly, and our hot water heater pulled out a few inches from the wall but its lines did not break. Fathers David and Martin immediately left by car to inspect the three church in our parish and found some damage but the buildings themselves seem to still be sound. People around the churches, including some husky, tattooed men who are not normally church-goers, had already rushed to help secure the buildings and clean up the debris. There were wall cracks, some broken statues and windows, and the chairs that serve as pews were thrown in disorder. The illuminated, Dominican cross high atop our main church, which is a well-known landmark and visible for a great distance, is askew. Large cracks have appeared in the convent of the Dominican Sisters who are our collaborators here in our parish, and we await a professional evaluation as to the solidity of the structure. Sadly, so far it is known that two people died in Mexicali and some were injured, but thank God our parish seems to have escaped such consequences. The radio news is announcing that in Calexico, just south of the border from Mexicali, both the downtown and the border crossing to it have been closed, and that the whole small city has been declared a disaster area because most of the buildings and homes are pre-code, not retro-fitted, and so not built for so strong a quake. Calexico’s population is 36,000, the same size as Benicia, CA, where we Dominicans have our oldest continuous parish west of the Mississippi. Mexicali, on the other hand, is home to 1,500,000. It is ironic that tiny, first-world Calexico, CA, USA, is being reported to have suffered more from the earthquake than much larger, third-world Mexicali, which was much closer to the epicenter. Mexicali is in a seismic zone and expects eventually “a big one”. The famous San Andreas Fault runs about 100 yards south of our rectory, right through the yard of the elementary school across the street from us. Offer a prayer of thanks that this earthquake, despite its strength, has caused us Dominicans, Friars and Sisters, no bodily harm, and that our parishioners seem also to have remained personally safe. The cost of the physical repairs remain to be seen, so pray for our benefactors upon whom we depend and who have been so faithful despite the troubled economy. Allow me to apologize that the battery of my cell phone was down, and because of the power outage, and because I do not have a car charger, I could not recharge the phone to call anyone on the situation here. What is amazing to me is that the recent earthquake that devastated the entire country of Haiti is reported at 7.0 (http://en.wikipedia.org/wiki/2010_Haiti_earthquake), whereas our quake yesterday was 7.2. It is a miracle eliciting much gratitude to God that we in Mexicali got off so easy. One radio station in Mexicali, 101.9 FM, resorted to car batteries and was the only station on the air after the quake. I was listening to it as I drove around checking on parishioners. The mayor declared all schools closed for today, Monday, asked all mothers who leave their children at child care centers to stay at home and not go to work, and asked the factories, who are the biggest single employers in Mexicali and are mean, to please be humane about their employees. Good luck! He also said the city’s emergency vehicles were running out of gasoline and that they were looking for the director of the government-monopoly gas stations to open them up to the emergency vehicles, but that the director lived in Tijuana and they as yet could not locate him. As of now, Easter Monday, 7:50 a.m., only one gas station is reported to be open- far from our parish; with another perhaps open nearby. Last night 101.9 FM reported that a large water main had broken and the flooding was undermining homes on a cliff so had to be turned off. That may explain why we still do not have running water even though our power is back. Happily as soon as my helping put our house in order I was inspired to go get 15 gallons of drinking water. A friend who runs a water station was still open, was almost out of the important liquid, but not yet drained. I am going to wash up now with a kitchen-pot full of drinking water. We also have to bless the person who invented hand sanitizer. A 17 y/o girl parishioner just called on my now recharged cell phone to tell me that at the quake a cousin of hers fainted and in helping her she sprained or broke an ankle. I presume such reports will now begin to trickle in. Oops, there goes another strong and long-lasting aftershock! Scary! Do remember us in your prayers! Fr. Bartholomew de la Torre , O.P.